I have to tell you, I'm not sure if I can keep this up for a year. It seems like it would get easier and easier but it is actually getting harder and harder. Just remembering to take pictures, and sometimes I will be with a group of people and will want to take a picture but then I don't want to bother them. This was the first day that we were back from our cruise and I spent the day doing laundry. This is a weird picture of our the laundry area in our apartment but I realized I have never taken a picture of it, and since we are in our last days in this apartment I want to capture every detail. As weird as it may be. Usually the laundry is all nice and neat in our laundry basket, but Sunday I just threw it all in there and started sorting. Not really an exciting day. I spent the evening still doing laundry and reading the book "The Last Song". It started out really slow but started to pick up about mid way through. Not sure how I am going to feel about Miley in this role. Not a big fan of her and her slouching. Every other Wednesday I meet with a group of women from my church. We are going through this book and I really love it. It is over the book of Ruth and is so interesting. I look forward to every other Wednesday! For the first time in over a week I went jogging. This is my little apartment gym that I use every other day. I am going to miss it so much. 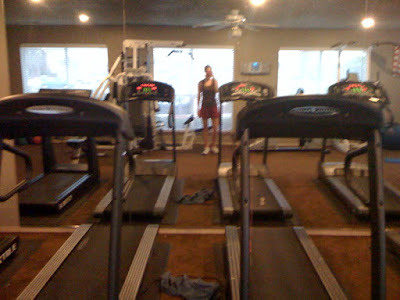 Those treadmills have helped turn me into a little jogger. I know it is much different on pavement and I will soon find out when we move into our neighborhood. I haven't talked Luke into buying me a treadmill just yet. Sunday (the 14th) was my birthday and Luke and I decided to celebrate my birthday on Friday. Saturday nights are hard for Luke because he likes to get in bed early to be ready for Sunday morning and Sunday evening we had plans with the staff at our church, so Friday night it was. I told Luke not to buy me anything, I mean I am getting a house in a couple of days so I figure that's a big enough gift in itself. But when I got home Friday Luke had set out these Tom's shoes. He is just so cute. Then he took me out to eat. It was a great 26th (eek) birthday! My mom came and spent the day with me for my birthday (even though it was the day before). We went to lunch, did a bit of shopping and then took her by our house. She loved it. It was a great day and I'm glad she came to spend it with me. She brought this cute little cake. I look weird in this picture and my hair is attacking my neck. Oh well. First of all, your hair looks so great in these pics. I love the blonde! Secondly, it is so hard to keep up with the pic a day. When I did it in '06, I beat myself up over it if I'd miss a day. But last year, I let go a little and told myself I wouldn't let it be a chore. If I forgot something, it was OKAY. You'll still be grateful for the days you did it! Such a fun post! I love all of the pictures! So you liked the last song? I really want to read the book and then see the movie when it comes out...I bet you had so much fun on the cruise! Happy late birthday! Have a great Tuesday! You will not know yourself when you get into your new house! If your house is in a nice area you may love jogging outdoors,! Your hair looks so GREAT in these pictures!! Which reminds me... mine is a hot mess. i love seeing all of the pics and what you've been up to :)! so cute and fun! That looks like a great Bible Study... gonna have to check it out! Need a close up of the Tom shoes! 2. PRECIOUS pic of Luke and your Bday gift! 3. Your sweets always talk about how much you eat and the weight you must be gaining and I think you have lost. your. mind. Love that you do this. So excited for you that you are getting the new home you have wanted for so long. Love that he gave you Tom's shoes!!! I love your hair- the lighter looks great on you! Happy (late) Birthday!! Looks like it was a good one!! I think you look great in all these pics and I love your white watch! I love that y'all get together with friends to watch a show, I wish we did that. If I wasn't so darn serious about UK basketball, we would have friends over during the tourney, but that's not going to happen! Happy happy birthday! I come home and dump out our suitcases in the laundry room too- it's much easier after you're tired from travelling. Happy Birthday to you! Chicken spaghetti is high on the favorite foods list, we make ours with Velvetta and rotel, yum! i'm new to your blog and i love your posts! i would love to have your chicken spg.recipe. I tried to do project 365 last year and it did get harder. I wish I hadn't stressed about a daily picture and just documented the weeks as they happened - 1 pic or 7, just enjoyed it. I ended up quitting by March. :( Good luck in continuing! I think it would be neat to have a year in pictures. -Love the book of Ruth. I may have to pick that one up. I just stumbled upon this blog and was amazed! I didn't know anyone else really did this 365 think besides my friends and me. We're on day 121 now and it's great.